CHASING FOOD DREAMS: Garrett Popcorn Shops® Open Its Third Outlet at Mid Valley Mall! Garrett Popcorn Shops® Open Its Third Outlet at Mid Valley Mall! I remembered tasting Garrett Popcorn® when it first open 2 years ago in Kuala Lumpur. No ordinary popcorn, Garrett Popcorn Shops® serves up tempting crunchy balls of gourmet popcorn that is coated with scrumptious flavors. With 60 years of Chicago tradition in its history, Garrett Popcorn® now feeds the international market across the globe. It may have started in Chicago, United States, but today Garrett Popcorn Shops® are now popping up all over Asia Pacific and Middle East. This April, Garrett Popcorn Shops® will be opening its third outlet at Mid Valley Megamall in Kuala Lumpur. “We are proud to chalk up another milestone for Garrett Popcorn Shops® in Malaysia with the opening of our third and latest Shop at the Mid Valley Megamall in Kuala Lumpur” says Lance Chody, Chairman and CEO of Garrett Popcorn Shops®. I am huge fan of corn, Serve it to me in any ways and I’ll always enjoy its sweetness happily. What makes Garret take popcorn to the level of gourmet? Garrett uses a custom “Golden Butterfly Blend” of butterfly and mushroom popcorn kernels. Mushroom kernels pop up into a rounded shape and butterfly kernels pop into a butterfly shape, creating a blend that ensures the perfect combination of texture and flavor in every bite. 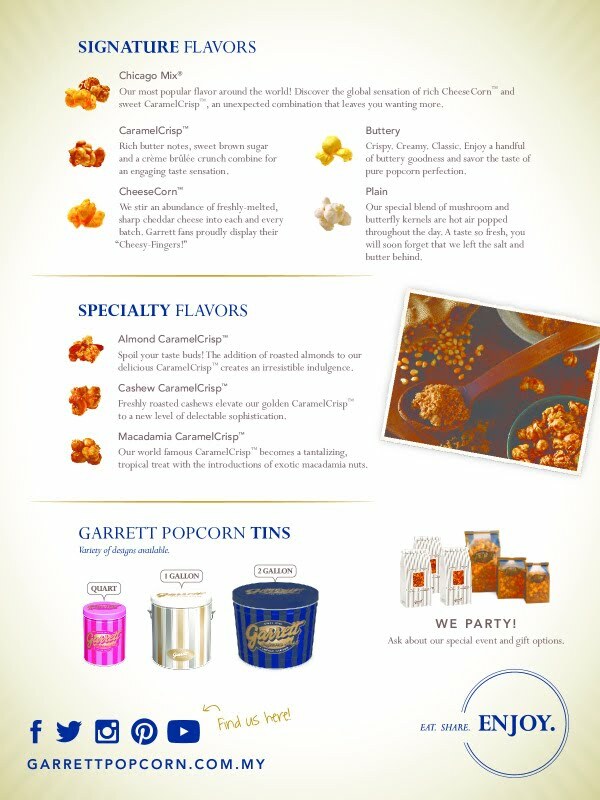 There are quite a few luscious flavors to choose from at Garrett Popcorn®. Choose from the signature flavors of Chicago Mix®, Plain Buttery, CaramelCrisp™ and CheeseCorn™ to their specialty flavors of Almond CaramelCrisp™, Cashew CaramelCrisp™ and Macadamia CaramelCrisp™. There are also limited special flavors available from time to time. I tried the 1 gallon tin of The Chicago Mix®, a combination of their signature CaramelCrisp™ and CheeseCorn™. Deep intense caramel coated nuggets of popcorn are contrasted with cheesy cheddar popcorn, rendering a gourmet combination of bittersweet and salty cheesy flavors. Packed with crunch factor, it’s no wonder Garrett Popcorn® is deemed the gourmet popcorn and continues to attract its followers from all over the world. Each kernel is serious well coated with flavor so that every kernel you eat gets maximum flavors. The Chicago Mix® is highly addictive and once you have started enjoying them, there is simply no stopping or going back to the regular popcorns. My family and I literally almost polished of the tin at one go! It’s just that good and addictive…. I am itching go grab their special nuts collection! In 1935, each member of the Garrett family was challenged to create a caramel popcorn recipe. One creation stood out from the rest and became known as CaramelCrisp® – distinguished by its unique flavor and delicate, crème brûlée crunch from other ‘caramel corn’ variants available at the time. When the first original Garrett Popcorn Shop® opened in 1949 in the heart of Chicago, a long queue of customers, all eagerly waiting to purchase a tin of handcrafted Garrett Popcorn marked the beginning of A Chicago Tradition that continues until today. Very little has changed from 1949; every batch of Garrett Popcorn® is still handmade with care throughout the day using old-fashioned copper kettles and wooden paddles. We mix our signature blend of kernels into our secret family recipe, passed down through three generations. “We like to say that Garrett Popcorn is Happy Food™ and we hope that our launch in Mid Valley Megamall this April will make Malaysians as happy as our popcorn makes us,” says Scott Schroeder, Chief Brand Officer of Garrett Popcorn Shops®. Not into popcorn but I sure would like to try this. Looks really nice.